Compatible with the brand new WordPress 4.9 and Visual Composer! The images will be presented in a horizontal carousel that is responsive and also works well in touch devices. In the settings of the plugin, you can set how many slides to show, the transition speed, if auto scroll is enabled, and many other settings. In the Grid layouts you can also include a live category filter, so your visitors can select which logos to see. You can use a enhance filter (example below) or a hide filter. And of course, you can set URLs to them, they can have links that can open on the same page or in a new page. You can enable the tracking option in the settings and you’ll have information on how many times the logo was clicked. It couldn?t be more easy to generate the necessary code to display the logos. Just go to the Shortcode generator, choose the settings you want and the shortcode and the php function that you can use will be generated and ready to copy and paste where you want! 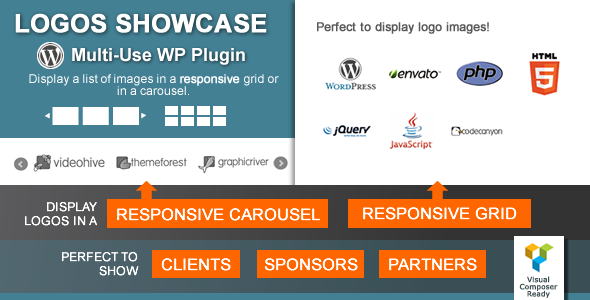 Shortcodes are to be used in posts and pages, while the php function will be necessary if you want to hard code the logo showcase in your theme files. You don?t like this feature to be called ?Logos?? Go in the plugin settings and change it to whatever you want! You also have a set of options to control the carousel, like the transition speed, number of slides to move, number of slides to show, if you want to display the controls or not, auto scroll active or not, etc. You can upload all your logos using the Media Library then select all of them and perform a bulk action to add them as Logo entries to the Logos Showcase plugin. Updated Slider code to be compatible with new jQuery versions. Corrected some errors that would appear with DEBUG mode ON. Added new option to limit amount of images to display and order alphabetically. Fixed small bugs and small CSS changes.